Equity benchmarks in Asia were mostly in a buoyant mood yesterday, building on their rally since the turn of the year. "The air of optimism remains thick as improving risk sentiment on the back of US-China trade talks has Asia markets accelerating higher," said Mr Stephen Innes, SPI Asset Management's head of trading and market strategy. The Straits Times Index (STI) pared Monday's dip to close at 3,332.04, up 6.18 points or 0.19 per cent, getting a lift from tech and banking counters. China led the region's gains with the Shanghai Composite Index adding 2.4 per cent to close at 3,253.60, a near 13-month high. Meanwhile, South Korea's benchmark registered 13 straight sessions of gains. On the Singapore bourse, trading clocked in at 1.31 billion securities, 3.5 per cent over the daily average in the first three months of this year. Total turnover came to $1.06 billion, higher than the January-to-March daily average by 3.4 per cent. Decliners slightly outpaced advancers at 206 to 200. Compared to the broader market, the benchmark index fared better on the day, with nine of the 30 STI constituents ending in the red. Among them, Golden Agri-Resources was the blue-chip index's most traded. It dropped one cent, or 3.2 per cent, to end at 30 cents with 35.7 million shares changing hands. Acknowledging that most agri counters in Singapore have sizeable exposure to Indonesia, Mr Brandon Leu, UOB Kay Hian's vice-president of equities and financial products, said: "The market looked like it was taking profit ahead of Indonesia's elections on Wednesday, to hedge their risk." Singapore bellwether banking counters all ended yesterday's session in positive territory. DBS Group Holdings closed 15 cents, or 0.6 per cent, up at $27.16. OCBC Bank finished two cents, or 0.2 per cent, higher at $11.69, and United Overseas Bank added five cents, or 0.2 per cent, to end at $26.66. Electronics manufacturing services firm Venture Corp added 73 cents, or 3.9 per cent, to close at $19.35. 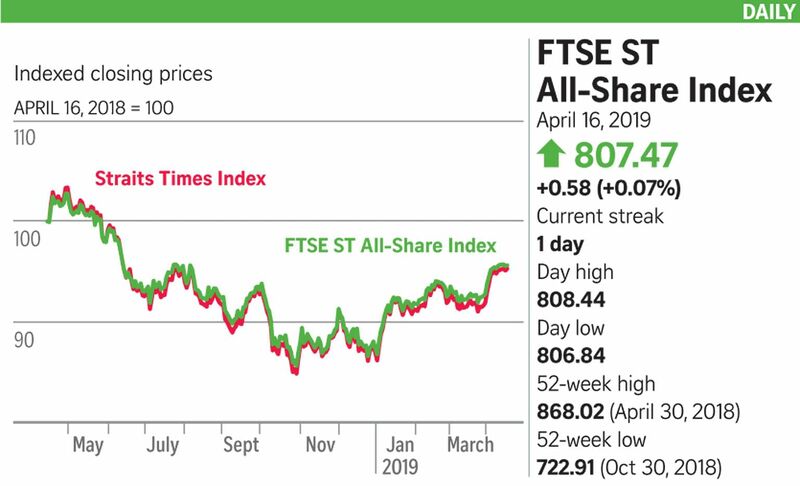 A trader said tech counters in the Singapore market were "likely led by the tech rally in Chinese equity markets on Tuesday". Among non-STI counters, Asian Pay Television Trust continued to gain on heavy trading. The business trust that is focused on pay-TV businesses surged 3.2 cents, or 20.4 per cent, to end at 18.9 cents on 88.4 million units traded.